In 2017, Shockwave members taught a class on wiring techniques at FIRST Faire. Shockwave also designed an “Engineering through Time” escape room for the Oregon Museum of Science and Industry in hopes to attract teenagers winning first place on the LEAP competition. We also connect with people through demos at sponsor events. We have come into contact with over a thousand employees & their families through our demos, spreading FIRST. Our team started an annual Mentor Roundtable in both Washington and Oregon where mentors share ideas of what is necessary to work with their teams. This ensures a quality education and experience for both members and mentors. Other mentors of local FRC teams swap information and ideas to solve problems and learn more about FIRST values. Additionally, Shockwave hosts the original Business Roundtable in which we collaborate with veteran and rookie teams discussing questions and concerns with sponsorship, finances, and business concepts. Both of these events ensure quality education and experience for over 50 mentors and team members. Shockwave members encourage creativity through STEAM among people of all ages. We were able to help others as we presented 3D printing at Camp Yakety Yak, a social skills day camp supporting friendship development for children with disabilities. 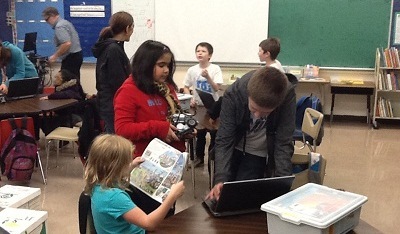 Shockwave volunteered at a TAG event where we demonstrated FLL robots to K-6 graders. It was an experience for Shockwave members to connect with younger students and spark interest in the FIRST program. We started the McKinney Elementary Robotics team, and one of our lead Shockwave members has been the coach of this team to this day. Shockwave members also walk over to our local middle school and mentor FTC students after school. We volunteer at these teams’ tournaments, and continue to make their FIRST experience the best it can be. Shockwave hosts a Robo Expo each year to debut our new robot to families, community members, sponsors, city and state government leaders, and community partners. Robo Expo enables our partners to network alongside us and debut their products. The Washington County Sheriff Office demos their reconnaissance robots used in practical law enforcement. Intel demos innovations such as their adrenaline dress, which are always impressive. The pinnacle of outreach for Shockwave this year was Go Baby Go. During the 2016 club season, many students from Shockwave partnered with Go Baby Go and Pacific University to build ride-on cars for children who struggle with mobility. Research shows that the mobility which Go Baby Go cars provides to these children benefits them cognitively and socially. Locally, Shockwave worked towards modifying child-sized cars, so that kids with limited mobility could control them using an adapted switch. Shockwave created a pink car with a special seat belt for a little girl to take home with her. This summer Shockwave was honored to be U.S. representatives in expanding the “Go Baby Go” program globally. Shockwave members journeyed to China with Go Baby Go, teaching therapists in universities and hospitals how to build the cars for children in orphanages. We purchased a child-size car from China as a model to test our plans on. After the ideas were laid out, Shockwave went to China to build the car for the kids and realized the car had been discontinued. This gave the members an opportunity to buy another car and brainstorm ideas quickly. The kids drove their cars around a practice course, and when one of them was taken out of his car for a little bit, he started crying because he didn’t want to leave it. This brought tears to the Shockwave student’s eyes, seeing the impact they had on these children. Shockwave also got to meet the only FRC team in Vietnam. Through this outreach, we have created a long-lasting bond with our fellow team, the healthcare officials we collaborated with, and the children of Asia, sharing our values with all of them and spreading the FIRST message. We link with the community promoting STEM curriculum. We assist teams when they need help. At Chezy Champs, when a team from our opposing alliance was experiencing technical difficulty, we used our time-out to give them time to repair their robot. We partnered with Hotwire to teach them wiring and electrical debug techniques. We combine efforts with teams to support and provide them helpful strategies. This collaboration endures relationships and contributes to the teamwork we share as FIRST members. Shockwave’s teamwork teaches students to join efforts with one another because when we link, we prevail. Shockwave members even spread belonging globally with Go Baby GO China. Shockwave traveled to China for Go Baby Go. When one of the children in Beijing was given his Go Baby Go Car he said, “Now we’re all a family!” This genuinely moved the Shockwave members, showing that we can share our belonging with not only the team, but with kids in other countries. Even with the diversity of language, they shared an amazing experience to remember that took place through their bonding. Shockwave also bonded with Green Arms from Hanoi High School in Vietnam during their visit to China. After a trip to the Green Arms workstation and a night out for dinner, Shockwave and Green Arms members shared a sense of belonging with one another. This is a sense that ensures each individual has the potential for greatness, a sense Shockwave continues to spread. Go Baby Go is a nationwide project that wants to establish roots all over the world, not just the US. Go Baby Go’s main purpose is to re-engineer ride-on-cars for children with mental and physical disabilities in their communities and beyond. Shockwave acquired their own Chinese ride on car thanks to the occupational therapy department and Sandra Rogers at Pacific University. Our intentions with the car however were different from the universities. We reverse engineered the car to find out how electrical system of the cars worked in China, and to modify it for handicapped children living in orphanages, where the same car can be used for different needs and children sizes. We are making a manual for orphanage workers in China to make their own cars. In China 98% of orphans are disabled. Additionally, with students at Pacific University, we built disability specific cars for local children. After the cars were finished the children were able to drive around the hallways with their parents and siblings watching and supporting. In a few short hours we were able to better the lives of several young children. Team 4488 volunteer for the project Go Baby Go in Oregon and has been a important influence of the Go Baby Go in China. The lack of physical movement experienced by some children decreases brain development and interaction with their peer group. The re-engineered ride-on cars allow children with disabilities who would not otherwise be able to access this type of movement to develop cognitive and social skills at rates similar to their peers. In the fall, Shockwave acquired their own ride-on car from China thanks to the occupational therapy department and professor Sandra Rogers at Pacific University. Our intentions with the car however were different from the GBG project in US. We reverse engineered the car to find out how the electrical system of the cars worked in China. We modified the car so that it would be adjustable to fit a variety of children living in orphanages in China with various physical needs. We created a manual which is being translated for orphanage workers in China to make their own cars. In China 98% of orphans are disabled so this project has the capacity of helping millions of young people. Additionally, working this past fall with students at Pacific University, we helped during a GBG Build day, where a group builds disability specific cars for local children. After the cars were finished the children were able to drive around the hallways with their parents and siblings watching and supporting. In a few short hours the GBG group was able to improve the lives of several young children. Send us an email if you are interested in helping in a Build day. Shockwave members have been in China in 2017 and 2018. They were working with an international team coordinated by Pacific University faculty that is studying availability of resources and training Chinese service providers for Go Baby Go programs in China. The Glencoe students spent three weeks touring the country and helping develop training systems and adapting vehicles for use in local orphanages. Please contact Willie Tenca for questions. The Mentors Roundtable, an event run by Shockwave, assists Portland area mentors to more effectively manage their teams, problem solve, and work better with students. Mentors have the opportunity to discuss how they work on their teams, shared ideas on how to solve problems, and gave tips on how to work with students. The Roundtable also covers how Mentors can help with safety and learned about the new policy put in place by FIRST to protect the students on their teams. With the help of one of our major sponsors, Out of This World Pizza and Play, Shockwave set up an all day, week-long FLL camp during the summer. The camp was taught by members from Shockwave and was open for children of ages 5 to 12. During the event, Shockwave demonstrated our 2014 robot and taught the campers about operating small and large-scale robots. Other sponsors have aided the team through providing opportunities and supporting our robot production. During our fall club season, Shockwave runs the Business Roundtable. This event is open for FRC teams to gather and attend multiple discussions focused exclusively on the business aspects of the program, with emphasis on sustainable fundraising. Guest speakers from both the FIRST and business community present public relations and fundraising strategies to dedicated FRC students who network and share information between teams. Our team aided Finley Elementary’s Jr. FLL Team during their rookie year by mentoring the young kids on robotics and the engineering design process in general. Our students voluntarily watched over the excited and energetic children, assisted in teaching them key concepts, and created useful PowerPoint presentations that were presented to further educate the Jr. FLL team. Shockwave collaborated with local artist, and the director of Creative Hillsboro, Christine Martell to build a STEAM project. The project we built, titled "Artosaur", is a six foot tall robotic dinosaur that debuted in the local Fourth of July parade alongside Shockwave members. Artosaur circulates the ideas of STEM while redefining the concept of art. As a result of this collaboration, we have expanded our relationships with local businesses and members of the community. Artosaur has been featured in several community events, such as the Oregon Air Show and childrens events at the local library. With Shockwave's assistance, Artosaur has received a grant from the city of Hillsboro worth $6,500 to assist in Shockwave's collaboration with Creative Hillsboro. Shockwave progressively aims to have a strong relationship with our community and we believe that we can accomplish this goal with the help of Artosaur. Since Artosaur's debut, it has continuously sparked interest in art and other STEAM aspects among kids in our community, and has currently interacted with over one thousand children. 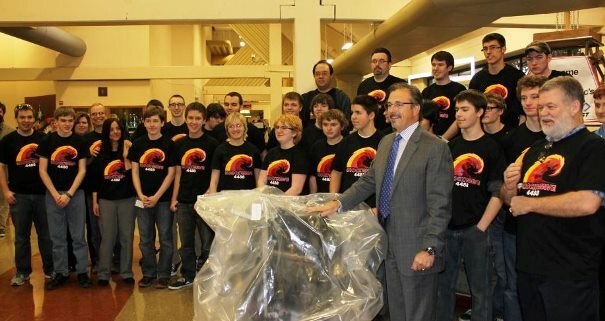 The Bag and Tag ceremony held on February 19th signifies the end of the build season. Each FIRST robotics team is required to stop all building operations and pack their robot away for the competition. The team is not allowed to further improve the robot to benefit them during the FIRST competition. To celebrate this milestone, Shockwave held a public celebration that included Hillsboro Mayor Jerry Willie, Washington County Commission Chair Andy Duyck, Intel Corporate Affairs Manager Jill Eiland, and 4 of Hillsboro&apos;s 6 school board members. Shockwave&apos;s celebration included an exposition of our FRC robots and FTC and FLL demonstrations from local FIRST teams. This activity is sponsored by the Glencoe FRC Robotics Team and is led by 3-5 Glencoe Team 4488 students. They meet every Monday, helping the Henry kids work in groups to build robots, program them to perform special routines, and then compete to meet challenges. Team 4488 organized and volunteered this important FLL qualifying tournament. 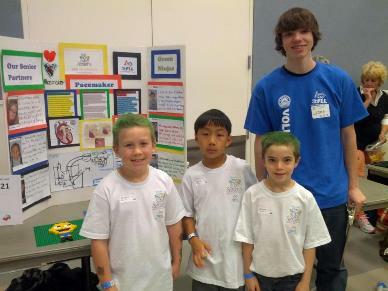 Team members of Team 4488 were pleased to volunteer as project reviewers at the Oregon JFLL tournament. Team Shockwave has presented to the Hillsboro Rotary Club and to the Hillsboro School Board to share our success at the Autodesk Oregon Qualification Tournament and to describe the community support we are providing through our outreach program. Meeting with business leaders and policy makers such as these builds awareness among important leaders and sends the message that FIRST Robotics programs build healthy hearts and strong minds in the future workforce.